At the end of the 19th century there was a growing passion for Japanese art, especially in England. This was the Meiji era in Japan (1868 - 1912) and Japanese artwork export drastically increased during this period. Whist Markers were not the exception. 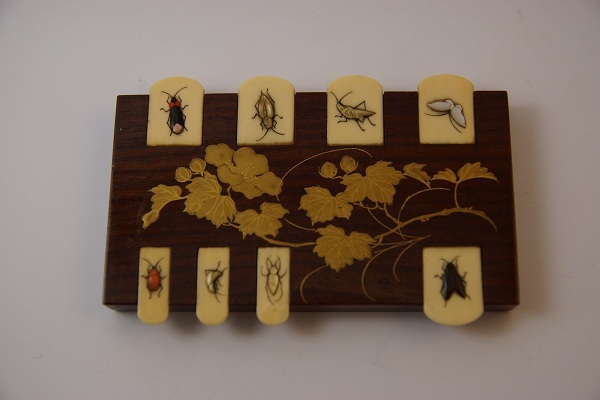 They are called Shibayama Whist Markers from the name of the technic used. Shibayama lacquer has been invented in Chiba just before the Meiji era by Senzo Onogi (who later changed his name to Senzo Shibayama) : small elaborated pieces of noble materials (semi-precious stones, mother-of-pearl, ivory...) are inlaid into lacquered wooden or even ivory bases. 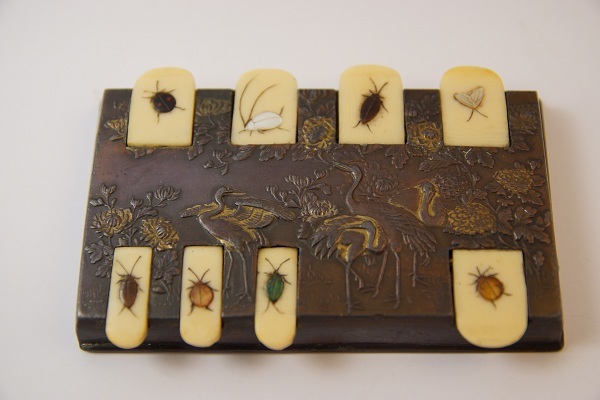 According to Yumiko Yamamori who did an impressive study about Japanese Export Furniture, all the patterns on the Whist Markers are symbols indicating autumn season : plants such as bell flower, pawlonia and insects that chirp during this period (crickets, grasshoppers...). They are used as season words in Japanese poetry called "haiku". Autumn is a Japanese favorite season and has always been a popular topic depicted on artworks. 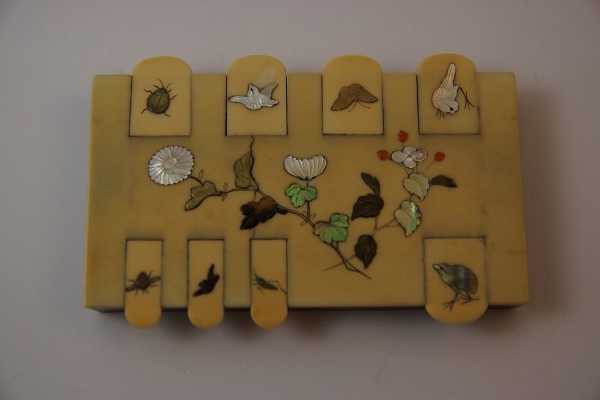 The exception is a butterfly which symbolizes spring, probably included here simply because it is pretty and decorative (but which Westerners would have known that in 1900 ?). It has to be noticed that Shibayama items were only produced for export as they were considered as excessively ornemental by most Japanese. With the success of Shibayama goods a lot of counterfeit items appeared which can explain the difference of quality sometimes found between pieces.